Thanjavur is a beautiful place. If you wish to spend a full day exploring the city, our full day hire service is the best option for you. It is available at our online portal. We offer this service for local city uses. 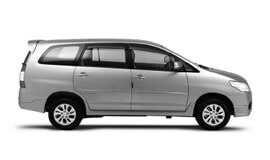 Local Full Day service at My Taxi India has been designed to suit a number of purposes. So you can use it for sightseeing, attending meetings, shopping, seminars, visiting hospitals, and a lot more. If you don’t have much time to spare in Thanjavur, look for our half day trip dedicated for local city tour usages. It will make for a perfect choice for you. Some of the best include Airport Transfer in Thanjavur, Car rental service for Marriage, party and event, Corporate Cab Rental in Thanjavur, Railway Transfer, visiting hospitals and a lot more. We also offer pickup and drop service in and around Thanjavur as per client’s demand. Our trained chauffeur will reach you on time. Right from airport pickups and drops to hotels pickups and drops, railway station pickups and drops, and bus stand pickups and drops, we offer you the best. You can avail these services from Thanjavur to your desired destinations. We offer expert to and fro taxi facility to our Thanjavur travellers. It is available for multiple destinations from Thanjavur. We offer taxi service to your desired destinations from Thanjavur as the starting point. We offer taxi services in Thanjavur for multiple city visits for a stipulated period of time. This is an exclusive package to make sure the tour is not hectic. Our multi city package will make it an exciting experience for you. We guarantee the best car rental services in Thanjavur at highly affordable prices. Thanjavur is widely known for hot and pleasant climate. The summers here (between March and May) are very hot. The temperature ranges between 25 °C and 40 °C. Monsoons (between June and September) here are accompanied with low rains. Winters (between December and February) are very pleasant with moderate temperatures. The best time to visit Thanjavur is October to March. As per official census report for the year 2011, Thanjavur District has a population of 222,943 residents. The major revenue of Thanjavur comes from tourism. The city also has service oriented industries. The traditional occupation in the city is agriculture mainly rice. Thanjavur is also known as the "Rice bowl of Tamil Nadu". Thanjavur is a popular tourist site in India. Previously the capital of the Chola kingdom, the place is home to several temples of architectural value built during that period. The place is widely revered by pilgrims. Some of the most interesting tourist places in Thanjavur include Ragavendra Temple, Brihadishwara Temple, Swami Malai, Thiruvanajozhi, Vellai Pillaiyar Temple, Lord Murugan Temple, Mercury Temple, Keelaperumpallam, Guru Baghawan Temple at Alangudi, Thirunallar, Chandra Bagawan Temple, Kanchanur, Kethu Temple, Thingalur Moon temple, Sukkiran Temple, Thiruvenkadu, Raaghu Temple, Thirunageshwaram, Sani Bhagawan Temple, Thirumananjeri, Palace & Saraswathi Mahal Library, Siva Ganga Garden, and the Siva Ganga Garden.